The field of particle astrophysics is at the forefront of research in both high-energy particle physics and astronomy. In The University of Alabama particle astrophysics group, we use fundamental particles to explore some of the most extreme objects in the universe, and use astronomical signals to explore physics beyond the Standard Model. 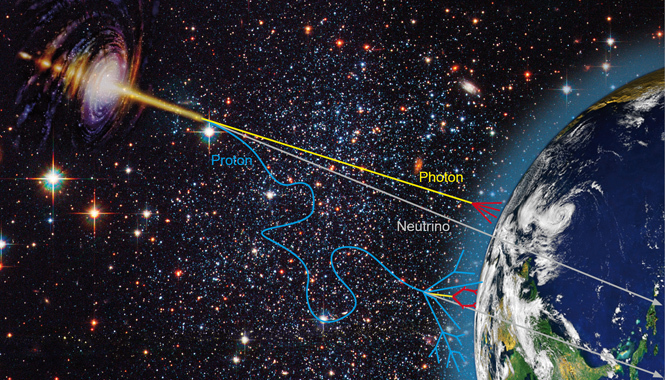 While high-energy photons travel freely through space but create other particles when they strike the atmosphere, protons’ paths are bent by interstellar magnetic fields, and neutrinos can even pass right through the Earth. All of these particles can be used to understand distant astronomical objects. 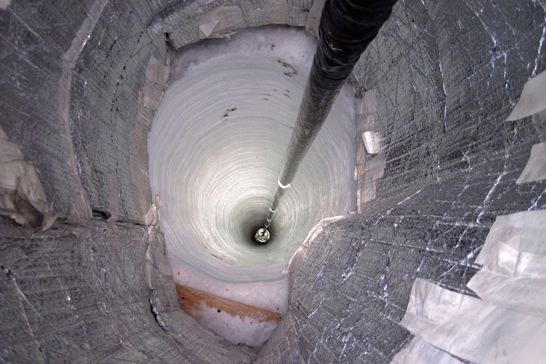 Near the South Pole, a basketball-sized light detector is lowered into a hole drilled deep into the ice. Almost 100 such holes turn the ice itself into an astronomical observatory by detecting light created when high-energy neutrinos collide with the ice. IceCube is the largest neutrino detector on Earth. Located at the geographic South Pole, IceCube consists of strings of photomultiplier tubes deployed between 1500 and 2500 meters deep in the Antarctic icecap. Construction of the IceCube detector was complete as of January 2011, with 86 strings instrumenting a cubic kilometer of ice. IceCube was built to detect astrophysical neutrinos at TeV-PeV energies from objects such as active galactic nuclei and gamma ray bursts, which are believed to be the source of the highest-energy cosmic rays.IceCube also searches for neutrinos from the annihilation of dark matter and explores fundamental aspects of neutrino physics with neutrinos produced by cosmic rays interacting in our atmosphere. The group of Dr. Dawn Williams is developing techniques to identify tau neutrinos in IceCube data. The Alabama IceCube group is also responsible for calibration of the detector with muons and LED flashers. VERITAS (Very Energetic Radiation Imaging Telescope Array System) is a ground-based gamma-ray instrument operating at the Fred Lawrence Whipple Observatory (FLWO) in southern Arizona, USA. It is an array of four 12m optical reflectors for gamma-ray astronomy in the GeV – TeV energy range. These imaging Cherenkov telescopes are deployed such that they have the highest sensitivity in the VHE energy band (50 GeV – 50 TeV), with maximum sensitivity from 100 GeV to 10 TeV. This VHE observatory effectively complements the NASA Fermi mission. Objects that emit gamma-rays are very interesting to astrophysicists. High-energy gamma rays are associated with exploding stars (supernovae), pulsars , quasars , and black holes rather than with ordinary stars or galaxies. Dr. Marcos Santander is interested in high-energy neutrino astrophysics and multi-messenger searches for neutrino sources using gamma-ray and X-ray telescopes. View of the Fred Lawrence Whipple Observatory basecamp and the VERITAS array. Professor Nobuchika Okada’s research interests are centered on phenomenological aspects of particle physics, in particular, new physics beyond the Standard Model. It has been clear in recent years that an extension of the Standard Model, i.e. new physics beyond the Standard Model, is needed to explain a number of experimental observations such as dark matter. In addition, the Standard Model suffers from several theoretical problems. These problems are expected to be solved by a certain new physics which is realized most likely at the TeV scale. The main theme of Dr. Okada’s research is to reveal new physics beyond the Standard Model from the theoretical point of view, based on the experimental results. Along this direction, Dr. Okada has been working on various topics of particle physics phenomenology such as new physics model buildings, supersymmetry, extra-dimensional models, grand unified theory, neutrino physics, high energy collider physics, particle cosmology, and astroparticle physics. For a publication list see here.